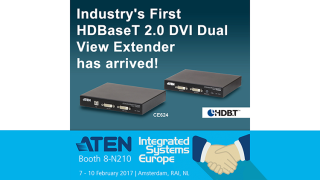 The What: ATEN has launched the CE624 HDBaseT 2.0 DVI dual-view extender. The ATEN CE624 integrates the latest HDBaseT 2.0 technologies to extend the most reliable transmission of dual-view video, audio, USB, and RS-232 signals up to 490 feet via a single Cat-6/6a cable, with the dual-view function enabling video output to be displayed on two monitors. The What Else: The CE624 enables integrators to provide a high-quality visual experience powered by HDBaseT technology and the convenience of a single Cat-6 cable to transmit uncompressed video with zero latency and multi-streaming for dual-view applications. The CE624 not only supports HDBaseT Standard mode up to 325 feet with 1920x1200 resolutions, but also provides a Long Reach mode, which extends two DVI signals and USB 2.0/audio/RS-232 signals up to 490 feet with 1280x720 resolutions. The CE624 includes three USB 2.0 ports and two-channel PCM digital audio to ensure fast transmission speeds for keyboard, mouse, and peripherals, and high-quality audio transmissions with DVI. The Bottom Line: The CE624 is designed for applications where convenient remote access is required, such as transportation control centers, medical facilities, industrial warehouses, and extended workstations.